An exotic ready-to-cook Malaysian curry dry sauce with roasted grated coconut, galangal, lemongrass and spices. Traditionally cooked with beef. Just add meat and water. Ingredients: Water, Spices (Galangal, Lemongrass, Ginger, Star Anise, Cardamom, Clove, Cinnamon) (13.4%), Roasted Coconut Flake, Onion, Coconut Milk (10%), Palm Oil, Chilli, Salt, Sugar, Tamarind, Garlic, Modified Tapioca Starch, Turmeric Leaf. 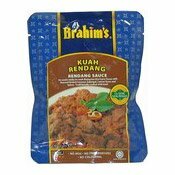 Simply enter your details below and we will send you an e-mail when “Rendang Sauce (乾咖哩醬)” is back in stock!